Gord and I are season ticket holders for the Toronto Rock lacrosse team games ... the Rock is a professional lacrosse franchise in the National Lacrosse League (NLL). This is our fourth year going to the games and our third year having seasons tickets. My pal, Liz, and her husband, Jamie, went with us to this afternoon's game. The Toronto Rock Cheerleaders were greeting fans arriving to the game. The Rock were playing the Vancouver Stealth. The Rock players huddled to get psyched. Only two of the four red-wigged guys were there. But there was a mini-red-wigged kid in the crowd. Tim and Gillian are also season ticket holders and sit in front of us. They were excited when the Rock scored the first goal. At the end of the first quarter, the Rock were winning 2 - 0. The goalies had their equipment measured. The Toronto Rock Cheerleaders entertained in the second quarter. Iggy, the Rock mascot, worked the crowd. The kids love Iggy and Iggy loves the kids! At the end of the second quarter, the Rock was winning 4 - 3. Earlier today there was a Mini Cheerleaders Camp and they, along with Iggy, showed up what they'd learned. Too cute! The Rock huddled at the beginning of the third quarter. 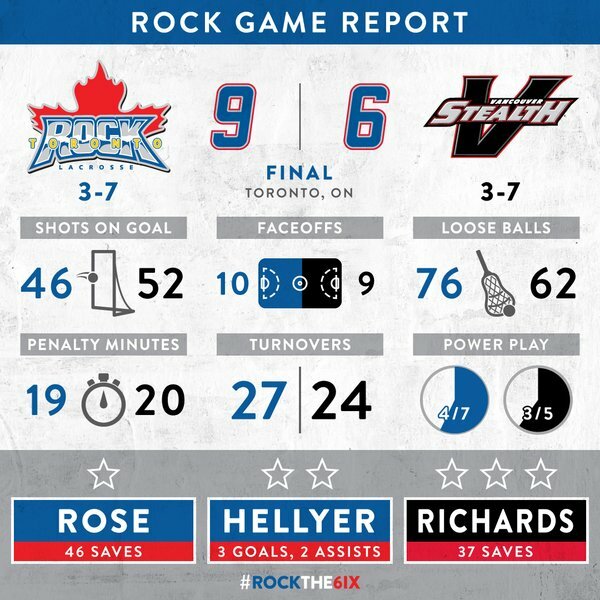 At the end of third quarter, the Rock were winning 6 - 4. The prize for the 50/50 draw was $6,000. The attendance at this afternoon's game was just over 8,000. The Rock won 9 - 6. Tim and Gillian were happy with the win. The Rock and Stealth players shook hands. The Rock players huddled together. Rock captain Colin Doyle was interviewed on TSN. Rock goalie Nick Rose (Rosie!) was the number one star of the game. This afternoon was his 100th game ... nice to have a win! It was a fun game! It was nice to have them win!